Looks like loading up the bike could become easier. Loading a bike in the bed of a pickup truck is one of the classic ways people have found to get a bike from point A to point B in the comfort of a car seat rather than a dirtbike saddle. While we’ve witnessed some hilarious loading fails in the past, most people have figured out how to safely ramp the bike(s) up in the bed of the truck for easy hauling. Things should get even safer and easier with the CarbonPro bed liner. Looks like the team at GMC has had motorcycles on its mind. 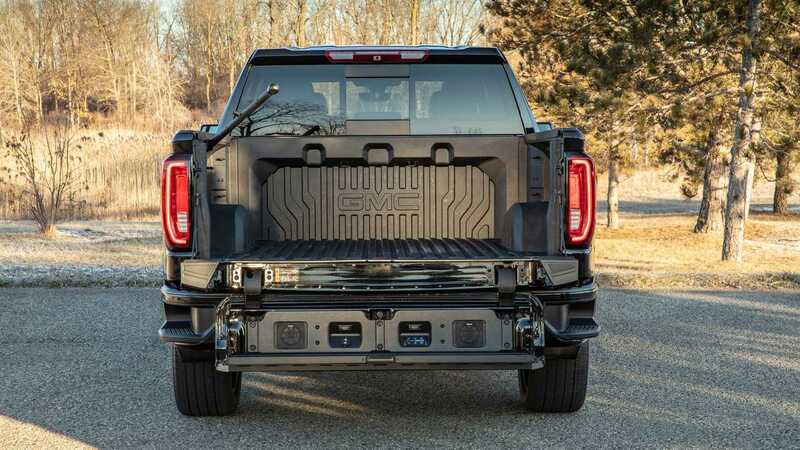 For 2019, the truck-specific branch of General Motors is launching the CarbonPro optional bed liner available on the Sierra Denali 1500 and the Sierra AT4 1500 trucks. What exactly is the CarbonPro, you will ask? As the name suggests, it’s a molded carbon fiber shell that replaces the usual aluminum or steel pickup beds. Why carbon fiber? Because it helps reduce weight—the material itself is lighter, but it also eliminates the need for rear wheelhouse liners—it increases the loading volume and payload, and is more resistant to scratches and corrosion. Thanks to weight reduction, GMC estimates that payload on the two models increases by at least 59 lb. What the carbon fiber shell also does is create a surface with added grip thanks to what GMC describes as a more “aggressive graining”, as useful feature when loading a bike since a slip could mean a drop from a height of two to three feet. The lining has even been molded with three wheel wells along the back of the cabin to help line up the bikes and stabilize them and is fitted with two additional anchoring points located at the front of the bed. The bed will easily accommodate motocross and enduro as well as road bikes. As for flexibility and solidity, the manufacturer confirms that the carbon fiber lining has been put through a series of rigorous drop, corrosion, temperature, and loading tests to ensure it will offer the same durability as its aluminum and steel counterparts. 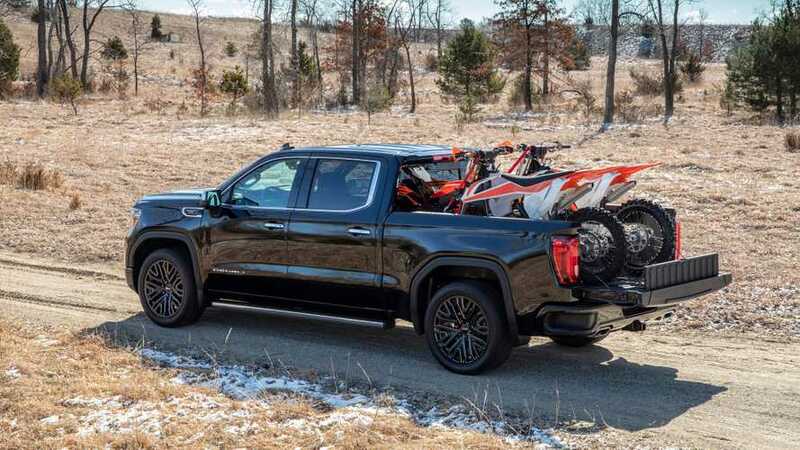 Afterall, loading a bike is one thing but carrying dirt and materials is another—GMC guarantees the CarbonPro can do both. The CarbonPro option will be available only on the two Sierra 1500 models for 2019, but the list of trims and models will expand for 2020. Pricing has yet to be announced. Whether it will be worth it will be for you to decide! DETROIT — Starting production in early June, GMC Sierra CarbonProTM Editions will begin appearing at select dealerships this summer, available on the Sierra Denali 1500 and the Sierra AT4 1500. The purpose-built CarbonPro bed is the first application of its kind for carbon fiber composite and delivers best-in-class dent, scratch and corrosion resistance. Spray-in bedliner not needed: Because carbon fiber composite is exceptionally durable, a spray-in bedliner is not necessary to help prevent damage and therefore will not be packaged on models with the CarbonPro The composite material is rugged yet nonabrasive.